Spoon 1/4 cup pudding into each pastry shell. Spoon the marshmallow creme into a resealable plastic bag. Cut off one corner of the bag. 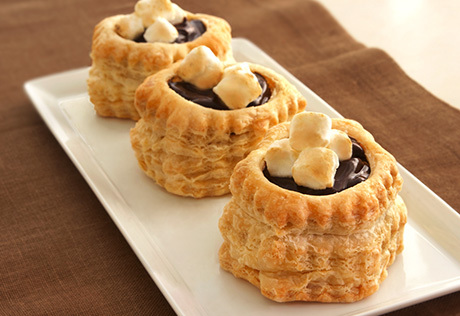 Pipe 1/4 cup marshmallow creme onto each pastry shell to cover the pudding. Heat the broiler. Place the filled pastries onto a baking sheet. Broil 4 inches from the heat for 1 minute or until the marshmallow creme is lightly browned. Tip: You can substitute 1 1/2 cups miniature marshmallows for the marshmallow creme. In Step 2, place 1/4 cup marshmallows into each pastry shell. Proceed as directed above.